"But baby, someone is wrong on the internet!" "How To Win an Internet Flame War"
to run in the opposite direction." "What Does the Computer Think?" With the exception of "Home Soil"[TNG1], in which Crusher instructs the computer to theorize on something, most of the time the TNG era showed us computers used in a way not dissimilar from computers today. You tell it to provide information, make your own theory or determination, and run with it. Or, via the vocal equivalent of clicking a "beam me up" icon, you tell it to do something it's already programmed to do. In TOS, though, it seemed that the computer . . . for all its whirring and clicking . . . was doing more thinking. There seemed a more frequent use of computer theorization. For instance, in "Mirror, Mirror"[TOS2], Kirk poses a few questions to the computer and lets it do the theorizing, and even provide an instruction list for what to do with the theory's application. Scotty followed along with its reasoning enough to know he'd need some help doing the work, but that's it. It may be that TOS was actually closer to future reality in that case. In a rather interesting article, it's suggested that sheer volume of information along with mathematical correlation might allow for a computer that serves more as analytic theorizer than info-search-tool a la Google. To be sure, this isn't necessarily a new idea. There have been many science-fiction stories about all-knowing thinking machines. Among other iterations, there was "Cyclops" from David Brin's novel The Postman, which also featured a "data net" along the lines of what you're currently surfing. But presumably, as we've gotten to know working PCs, the idea of what they're capable of has declined to some extent. That is the best explanation I can think of for the less impressive way they were written in the TNG era. To be sure, the computers didn't seem to be any dumber by any means, but they simply weren't asked that many theoretical questions as I recall. 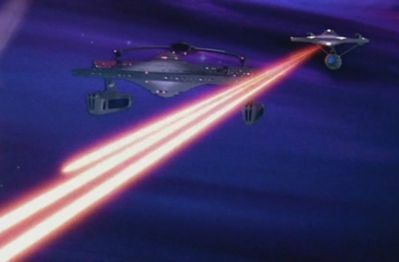 The TMP-era ships have phaser emitters that are rectangles with two little hemispheres on top. Generally I've rolled with the common idea that the two hemispheres were little ball turrets or some high-tech no-moving-parts emitter thingy or what-have-you. But whatever it was, there were just two per rectangle. That's three beams with a fourth on the way, though there's enough wiggle room for the fourth to be non-overlapping with one of the other three (and hence still keeping the three total). But that's three. Three, I say. Back to the drawing board? The thread above could very well split your side if you've followed the debate for any length of time. The same people who seriously consider the notion that a TIE fighter is sufficiently armed to wipe the floor with any ship named Enterprise consider whether there's any such thing as a wanked pro-Wars argument or pro-Wars wankers, and find that there really aren't any. In other news, back when David Duke, Mahmoud Ahmadinejad, and like-minded souls had that conference in which they claimed the Holocaust never occurred, a straw poll was held in which they found that there wasn't a single Jew-hating sociopath in the room, and that all anti-Holocaust arguments therein expressed were both logical and valid.